A lot of people plan dinners and understand the importance of doing so, but lunches and breakfasts are often spur of the moment or just something simple like toast or cereal (both of which have downfalls in the traditional foods realm, unless you’ve made your own homemade versions). Your mission, if you choose to accept, is to plan your breakfasts for (at least) a week. A nourishing breakfast starts the day off right with good nutrition, fuel for your bodies, and energy for the thinking and working you’ll do during the day. It’s a time that we moms have our kids hostage before sending them off to school where they might trade their homemade crackers for cheesy puffs, and we’ll never know it. Breakfast can be a hectic time of day, too, so I totally understand wanting to keep things quick and easy. 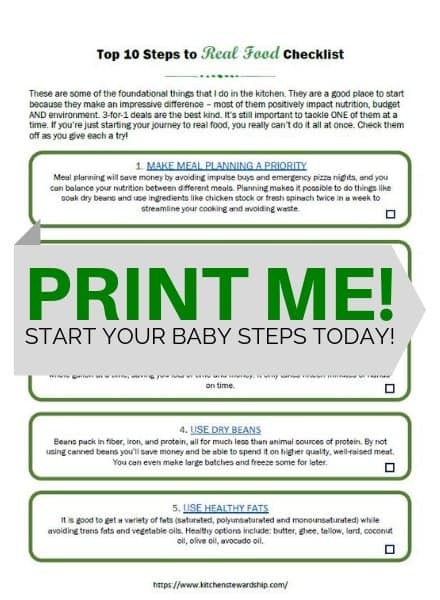 Planning ahead can help out a LOT. You may be able to plan just one day ahead for most breakfast meals, since many won’t need any prior preparation other than perhaps setting some pancakes to soak. However, I also think it’s incredibly helpful to plan a whole week. That way you ensure variety, make certain you don’t forget to choose what to eat the night before, and can do all the prep before you’re tired and it’s bedtime if you want. 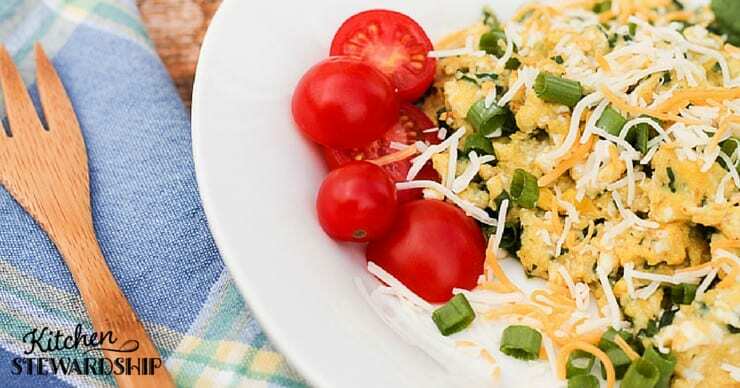 You could try my best scrambled eggs recipe, chop fresh onions and peppers for an omelet (along with other seasonal produce you have on hand and even leftover cooked beans), and consider letting the kids help. When my daughter was 3 she refused eggs for months on end. Then I let her help me make scrambled eggs on a Saturday morning and she ate three servings. She’s incredibly stubborn. But I taught her to keep her hands away from the hot parts of the stove! It takes a bit more time to work with the young ones, but it’s worth it – my oldest son has been able to make eggs by himself since he was 6. It saves me a lot of time when he does this! Soaked oatmeal with dried fruit, cinnamon, unrefined coconut oil, and raw milk. The cinnamon and coconut oil help me avoid sweeteners entirely, but sometimes I’ll add some real maple syrup as a treat. My family enjoys this baked oatmeal recipe a lot. I like to soak the oats TWO nights before I’m going to serve this delicious dish, and then make the entire recipe (right in the 9×13 pan, so no extra dishes!) the night before and refrigerate it. Put it in a cold oven, turn it on to 350F, and set the timer for 40 minutes instead of 30. Perfect every time and zero work in the morning! I also cut the raisins in half, at least, and sometimes use applesauce instead of apples. You can store leftovers at room temperature for a few days, too. One pan usually serves our family for two breakfasts. I usually pair green smoothies with soaked oatmeal since my family, the husband especially, doesn’t feel that smoothies alone make a meal. Sometimes we put them with eggs, but I’d rather not as the calcium in the smoothie inhibits the absorption of the iron in eggs. Late summer through fall and winter (depending on where you live) is a great time of year to grab fresh kale at the Farmer’s Market. Lightly steam it and freeze it or dehydrate it for smoothies later. This is our family’s favorite recipe! It’s a carb-filled breakfast, but try to include a fried egg or some breakfast meat or yogurt alongside the pancakes. 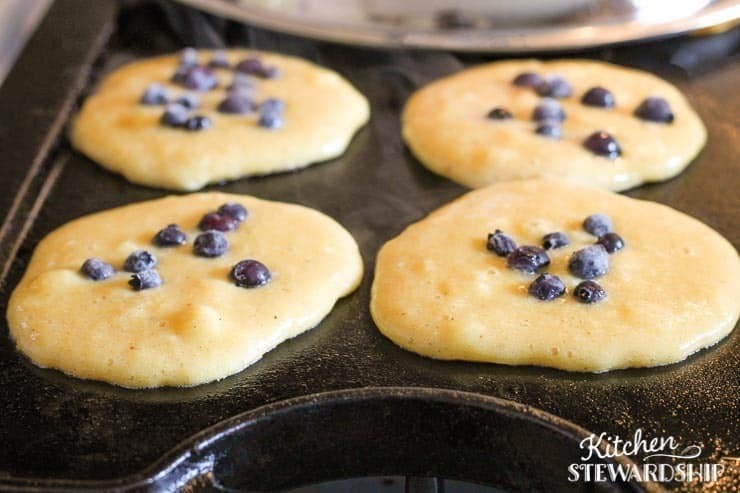 There are far fewer carbs and more eggs in these coconut blueberry pancakes. 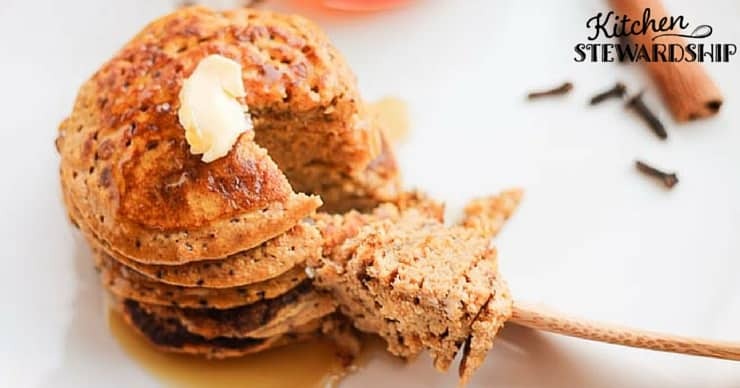 There’s also this grain-free pumpkin pancake recipe that you can make with any fall orange squash or even canned pumpkin. 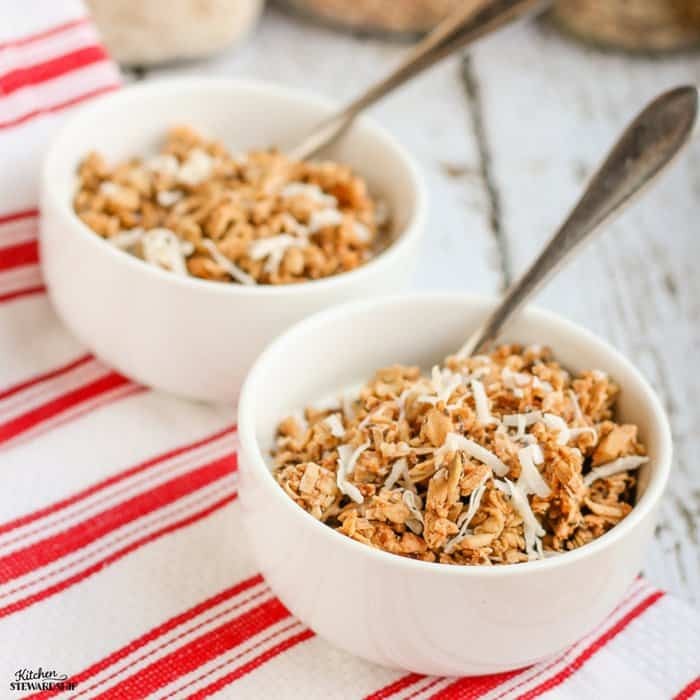 If you miss being able to just pour cereal and milk and have made a commitment against boxed cereals and their extruded grains, try my homemade granola, or better yet, the soaked granola version, available only in the Healthy Snacks to Go eBook, along with another grain-free granola. Alternatively, you could make healthy homemade granola bars to prepare for those times you need something quick on the way out the door. Make breakfast burritos with homemade tortillas, cooked sausage, scrambled eggs and seasonal veggies. 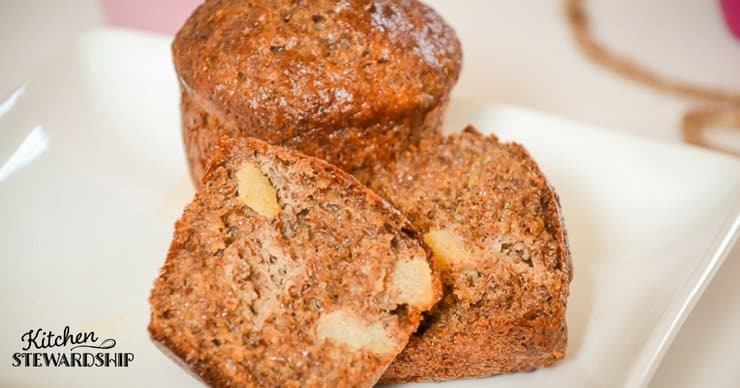 These could be made in advance and refrigerated or frozen, then warmed in the toaster oven when you need them for a quick, hands-off breakfast. Even though this list is looking long, sometimes I feel like I just don’t have any ideas for breakfast that haven’t been done recently (especially when I’m “planning ahead” at midnight the night before *sheepish grin*). How about you? What else do you serve for a healthy breakfast? Next Post » Does a Child Really Cost a Quarter Million Dollars? I follow the primal diet, and my breakfasts usually revolve around pastured eggs. My favorites-scrambled eggs with diced onion, green pepper, and tomato mixed in; scrambled with onion and mushrooms; scrambled with onion, pepper, mushroom, and 1/4lb Applegate bacon mixed in-yum! Sometimes I also mix in a bit of Breakstone chipolte sour cream to give it some kick 🙂 I also eat sausage or grass fed ground beef along side the eggs several times a week. Kate, Huh, now there’s a weird conundrum, eh? I didn’t know that! All of them? That’s atrocious. I witnessed our school’s breakfast this year, and besides the fact that there was plenty of *yuck* offered, there was so. much. waste. Who gives a 5yo (4yos, actually) a cup of yogurt, a banana, a corndog sausage thingy, a pint of milk AND orange juice, and potentially some cereal and other choices! There was more than I could eat on each tray, and most of it went right into the garbage. So sad. I always try to plan breakfast. The plan usually looks like this: M: leftovers (either bfast made from leftovers or leftovers of the weekend’s breakfast), T: sourdough pancakes, W: leftover pancakes, Th: soaked whole wheat biscuits, F: Eggs and toast, Sa: Waffles and sausage, Su: baked oatmeal. But most weeks I make it to the pancakes on Tuesday and then go into survival mode for the rest of the week, and we end up eating a lot of leftover pancakes and eggs and toast. But even then I consider it a victory because we’re not eating cereal! I LOVE that you have your son help in the kitchen- I do too, but we haven’t worked our way up to making eggs with my 4 year old yet. And she doesn’t like eggs, although your success with your daughter gives me hope! 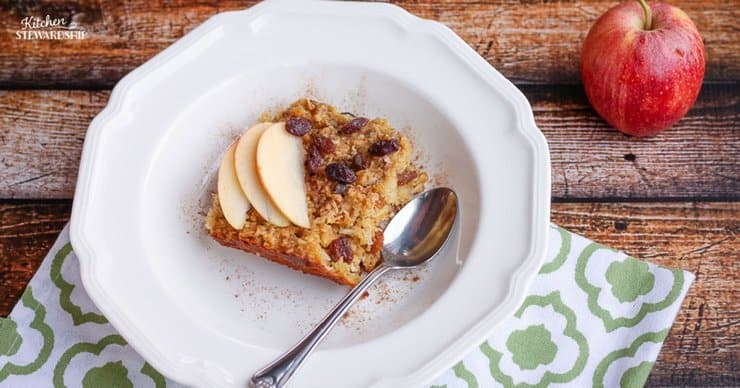 I also love the suggestion to cook the baked oatmeal the night before- the only drawback of baked oatmeal is that it takes 40 minutes to cook, and no one ever wants to wait that long for breakfast in the morning, not even for baked oatmeal (which is a favorite here with everyone, even the picky ones). I’ll have to do it that way next time! I cook enough baked oatmeal for a week (put in frig) because that is all my dh wants right now. ( he occasionally changes the fruit he puts on top) and then I take out a square and pan fry with alittle butter for about 5 min, so good. Or you could put in toaster oven for a few. Brandis, I don’t actually cook the baked oatmeal the night before, just mix it up (b/c that step takes about 20 minutes for me; I guess I’m slow). I get up earlier than others though and put it in the oven. I initially thought when reading your blog, “Leftover bacon?! What universe are you from?” lol Excellent idea. I don’t think I’ve ever put breakfast in a crockpot. I just got mine going. Thank you. Can’t wait to see how it all turns out. Used this and that, added seasonings, etc., took some cooked sausage/gr. beef from the freezer, added some beans and veggies. Lol, I know, but it does happen sometimes. My kids are still little, so when I cook bacon on a weekday (when my dh is at work- he goes in really early) we usually have leftovers. Thanks for all the bfast ideas. My husband is an oatmeal kind of guy, but I like variety. Usually I get him off too work then make myself something, or sometimes eat with him. Funny I should read this post today, I was pouring some special k in my bowl thinking I need some other fast ideas! I plan meals a month at a time, breakfast and lunch included. Breakfast choices change by the day, but the whole week repeats all month. Right now (summer) M&W are ‘yogurt bar’ – a bowl of yogurt with choices of things to mix in like homemade granola, homemade jam, soaked and dried nuts, coconut flakes, fresh fruit, etc. T&TH we have active days, so eggs or bacon – or both, sometimes with homemade bread, other times with muffins. Fridays this month I’ll be making sausage biscuits. Saturdays we do a ‘fry-up’ – any combination of eggs, bacon, tomatoes, bread, and mushrooms. Sunday is reserved for croissants, or pancakes, waffles, french toast, with bacon or sausage. Other choices we will rotate in – grilled cheese sandwiches, baked oatmeal, homemade ‘poptarts’ and scotch eggs. We are big breakfast eaters. Eggs are featured 4-5 days a week most of the time. Oatmeals, and occasionally pancakes, waffles or such are always popular. I plan our meals 1-2 weeks at a time and I plan breakfast, lunch and dinner. I need help for lunch ideas (fast ones) I am usually so busy it slips up and we are so hungry and i don’t have aclue of what to fix. We do eat leftovers but usually don’t have any that much. I would love to know what others prepare for lunch when they don’t have 30 min to 1 hr to prepare. This post on healthy lunches might help you. We’ve fallen back on PB or yogurt cheese on homemade crackers a few times this week, w/ cut vegs and ranch and a bowl of yogurt. Not gourmet, but it’ll do! I have a friend who has 2 teenage boys who want those awful protein shakes to build muscles for football; does anyone know of any more natural alternatives to that breakfast/snack? Or even a more healthy powder that they could use to make the same thing? An even harder kick in the pants- thanks! 🙂 I was planning on doing this anyway but was supposed to get it done last. And if you skip one week you will probably skip another. 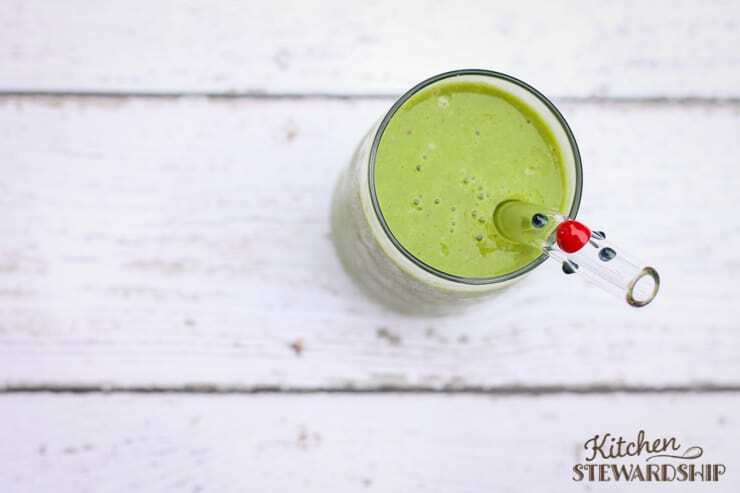 I plan on making soaked oatmeal, variety of pancakes and possibly waffles, baked oatmeal with steel cut oats, some kind of hearty muffin or banana bread, green smoothies and “fun” smoothies (just no spinach sometimes the kids are tired of seeing green)– all to have in my freezer. Making it that much easier for school days. I will also be experimenting with some egg dishes- my oldest is not a fan of just scrambled eggs so I see omelets, fritattas, and breakfast burritos in our future!! 🙂 Oh also found a english muffin recipe that I am going to alter a bit and make breakfast sandwiches… phew I better get to work. Thanks so much for this challenge! I have been thinking to myself that I needed to plan breakfasts more, but it sometimes takes hearing it from someone else! I tend to default to scrambled eggs WAY TOO MUCH because we always have eggs…and it’s easy. I’m sure my family would enjoy some variety. 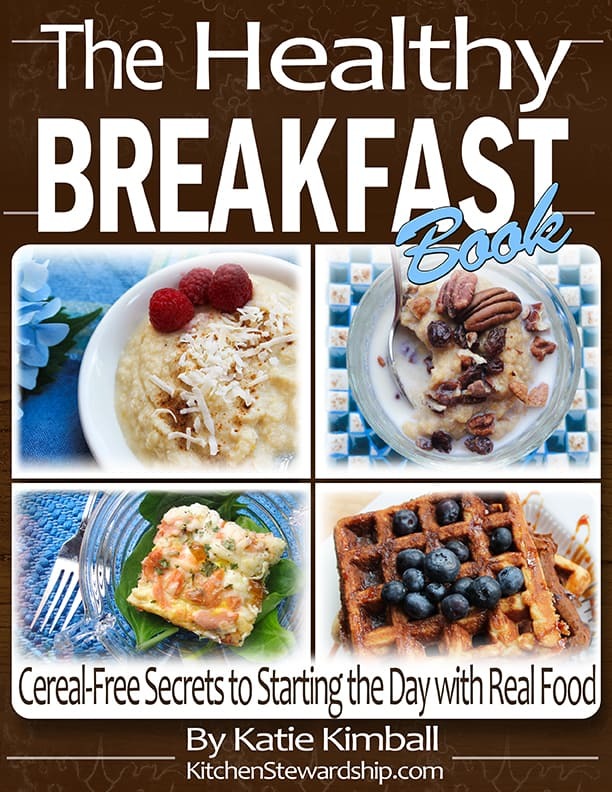 Hmmmm…maybe you should write a breakfast e-book for all of us?? The standard breakfast here is eggs and bacon with a smoothie. And if I can’t manage to cook, the kids will eat whatever I’ve most recently baked. This morning they each had an almond flour chocolate cookie or two before I got up to make the eggs. There are often almond flour baked goods floating around that they eat, or they’ll pull frozen fruit out of the freezer. And don’t forget to think outside the box! A cheesy potato-and-ham casserole could be delicious! Or omelets, or leftovers…. My kids have been known to eat hot dogs for breakfast in a pinch (good ones, obviously). And they love strawberry kefir. My son loves plain yogurt, so I will sometimes just serve him that. Now I want cheesy potatoes and ham…and I do have ham that needs eaten…. So, I’ve been trying for a long time to get away from so many grains for breakfast (like you said, fewer carbs for breakfast), but we get so tired of eggs… every. single. day. It seems like all the healthier breakfasts suggested seem to be pretty carb heavy, even though they are soaked grains. 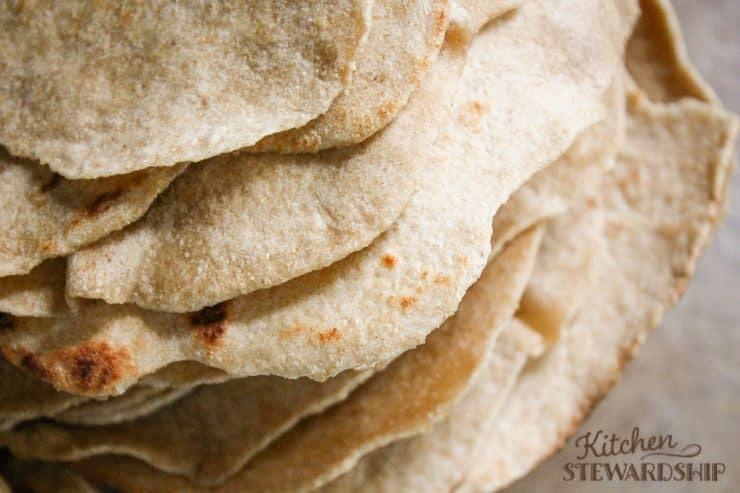 Any quick not-grain-based breakfast ideas? @Jessica…I’m glad you agree about an e-book! I hope she will add it to her lineup because it’s really needed! I would buy it for sure! I also wrote a post on breakfasts today! Do you purchase anything else from Country Life? Yes! Almonds, bulk grains, raisins, and coconut are among the items that come to mind. I always have to check their prices, but on most of those they’re very competitive. Our family loves muesli! It is quite simple to make (in the evening for the next morning) and is sooo delicious! Mix well. Refridgerate overnight, spinkle with some walnuts or other nuts in the morning and voila -ready to be enjoyed :). I’ve heard a lot about “overnight oats” in the last year, which is very similar to this recipe. I wonder if they are sort of “soaked” during the process even though they’re in the fridge instead of at room temp, but I would worry “no”. Many would also say that uncooked oats are a big, indigestible no-no. I wonder myself if you can swap out the fruit juice (still big fructose rush w/not enough fiber to balance it out) with another, healthier liquid. I know, I’m messing with your family favorite, but you still want to be careful of sugary carbs in the a.m., even natural sugars like fruit and juice. Thanks so much for the feedback on this recipe Katie! This is very good to know (as I haven’t studied all the subtlties yet- being new to this blog :)). Will do more research and development then- to make it even better/ healthier :). Thanks a lot! Very non-traditional breakfast food (read: I made this up, following the grand non-American tradition of sweet omelets) – “Eggs ‘n’ Apples.” Quarter & core an apple. Grate the quarters using a box grater. Melt butter (or coconut oil) in a skillet, and saute the grated apple in it. Beat 3 eggs in a bowl. [Optional: a bit of vanilla, and/or maple syrup, and/or honey, and/or raisins, especially if the apple is not very sweet.] Sprinkle the sauteed apple in the pan generously with cinnamon. Pour the eggs over the apple in the pan; scramble. I prefer these eggs more undercooked than I typically like scrambled eggs – a bit custardy. They can be topped with syrup/honey or sliced almonds. OMG my brother LOVED apple omelets. To be perfectly honest, I have no idea where he came up with the recipe, but I know that he first made it in junior high home-ec (omelets were one of the dishes everyone made, but I don’t think he got the apple idea from the teacher as I took the same class). Of course, his was uber unhealthy, using apple pie filling for the middle. I’d never thought of trying a healthy version- I’ll have to give this a go. This may even encourage my picky daughter to eat eggs… although I’m not going to get my hopes up. I bought your camping cookbook and I was trying to make the soaked English muffins today and I was wondering why the regular recipe calls for 4 cups of flour and the soaked only calls for 2 cups? You’re right, those directions aren’t exactly stellar – but even in the soaked recipe, I still use 1/2 white flour. So you soak 2 cups flour, then “starting with the one-hour rise” part means that you add the rest of the 2 cups white flour with the butter and go on from there with the dough. Does that help? That’s why I disapprove of school provided meals for kids. They get fed garbage. I realize that it avoids the issue of kids trying to learn on empty stomachs, but as far as I am concerned, there is a parental issue involved. Why are parents sending their kids to school without feeding them? And is it any better to spend public funds on the school meals that end up in the trash, except for the stuff like the corndogs that should be in the trash? What happened to the idea that not feeding your kids, but having plenty of beer, soda, cigarettes and chips amounts to negligence? Sorry, that’s not Politically Correct, but a friend of my son’s was in that exact situation until recently. He was a fidgety rack of bones at 30 # underweight, living on fruit loops and ramen, but the spending priority was for the booze and smokes. Mom is a nurse. It just disgusts me. I don’t plan our breakfasts as everyone is on a different morning schedule, but we do have yogurt, bread for toast, frozen multigrain waffles, fruit, granola, a variety of muffins, all homemade, as well as bacon and eggs to choose from and everyone is capable of preparation. In winter we add hot cereal to the list. how to feed others, especially the poor, is such a dilemma, I know. You definitely described a frustrating situation!!! If this kid had been from a “poor” family, it would have been somewhat understandable. As it is, he would not qualify for a subsidized school meal because his family is not low income. There are two new vehicles in the driveway, cell phones all round, several computers, and televisions in all bedrooms, including the three year old’s, one in the family room and a bigger than life flat screen in the livingroom, all on 24/7. And a 5 day trip to Mexico for a wedding, while this boy stayed with us. It’s not about money or the lack thereof, it’s about priorities. He finally “rebelled” enough to be sent to live with his birth father early last month, and put on ten pounds in two weeks. And he is finally allowed (yes, allowed) to eat fruit. Oatmeal…every morning…we’re real exciting that way! Occasionally the oatmeal gets traded in for toast, fruit and milk. Haven’t figured out yet how to soak oatmeal so it doesn’t taste sour. And my husband doesn’t even cook his oatmeal — just honey and water. So, not perfect but better than boxed cereal! I really really really need to work on this. I’m from Ireland & find it really hard to come up with healthy breakfasts. Irish people eat more boxed cereal per head than any other country in the world. I did not have a real food upbringing & generally ate boxed cereal for 2 meals a day. I really struggle with the concept of cooking a breakfast. Cooked food in the morning really makes my stomach turn. At the moment we eat a lot of porridge but the kids get sick of it so I have an emergency box of rice krispies which I really hate using. I need a good swift kick up the rear to get me moving on this one so I’m going to give your challenge a go. Katie, when you put your baked oatmeal in the fridge for the night, do you cover it with a cover that fits your 9×13 dish or something else? My big glass baking dishes did not come with covers, and I don’t really want to use plastic wrap or tin foil. So I guess I would just have to dirty another container and pour its contents into the dish in the morning. I honestly think this is one of the ways that women put too much unnecessary pressure on themselves. The idea that the family needs variety in everything they eat. Pick one or two healthy things for breakfast and that’s good enough. I sincerely think that when we worry so much about variety in our diets we are encouraging discontent, in ourselves and our families, and making a daily hassle out of feeding ourselves. Our kitchens are for feeding our families, not providing restaraunt-level variety and novelty. It’s the Food Network (which, admittedly, I enjoy) mentality creeping into our homes. I’m not saying don’t change things up when you feel like it or when a good opportunity presents itself (such as when a fruit comes into season). But I just don’t think we need a breakfast “menu”. Have a healthy meal or two available and let them be nourished and grateful. I just can’t imagine even expending the mental energy to think or decide what to make each morning. At our house, we have almost every morning all year long: fresh milk, oatmeal, small servings of juice, eggs, and sausage. It’s a substantial meal (I think of it as a power meal, since I pretty well pack the oatmeal with stuff), but it doesn’t vary a lot. And no one complains about getting bored with it. I can’t imagine women in traditional societies, or in Little House on the Prairie, stressing themselves out about providing their families with variety, especially at breakfast. I think we should take a lesson and cut ourselves a break. Ma Ingles would. I’ve been thinking a lot about that with snacks and packed lunches, an area where I always have the same options! Packed lunch: egg salad or cheese on crackers, cut begs, yogurt again, fruit. My kids haven’t complained about monotony, and for that I’m glad. I suppose even processed food Lunchable families have about the same thing every day. Good point on variety being a “want” not a “need!” If you’re soaking oatmeal or whatnot, though, you at least need to plan ahead, even if it’s planning the same thing every day. I usually just plan breakfasts in my head, not on paper. Thanks for the new perspective! Country Life online store: what type of oatmeal do you buy? and do you know if the cornmeal they sell is unbromated? Don’t forget soaked rice, or Breakfast Rice as we call it. You could make a big pot prior and just doctor it up the next morning or the one after easily. And hummus is a favorite snack food in our family. Pair it with homemade crackers or veggies. Yum. I will say that I have been a terrible homemaker when it comes to cooking meals these last few months because of the restrictions. I get discouraged and then don’t act. I don’t plan, so we “make do” and scramble to get something somewhat healthy. I run out of ideas because each one has its reasons why it won’t work — child with serious teeth issues and need to avoid grains and sweets while eating more organ meat and broths, husband with diabetes and a sweet tooth so that if he gets too many grains, even “good” ones that don’t raise his blood sugar, he’ll start craving sugars and give in to temptation. I love reading all of the comments and getting ideas for variety. I agree with the one commenter who said that variety isn’t necessary, and I agree, but we like to mix it up occasionally around here. Our standard breakfasts are eggs (with toast or tortillas or smoothies) or oatmeal (either regular or baked–soaked either way). Sometimes we have muffins, waffles, pancakes, banana bread, etc. but we generally stick to the couple of basics. I don’t actually write any of it down on a meal plan, because I always keep oats and eggs on hand, so as long as I plan ahead at least the afternoon before to start soaking oats, I don’t need to stick to a written plan.